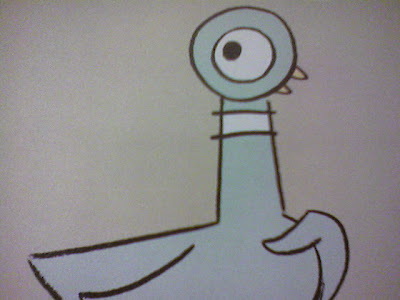 Elisha Guido Writes: Pigeon wants a puppy! I read a kids book today. I think it is officially my favorite book. I came very close to buying it. It pretty much portrayed my childhood. I really only took this picture because the bird only has one eye. It is a cute bird. I've read all of these books. I like "don't let the pigeon drive the bus"